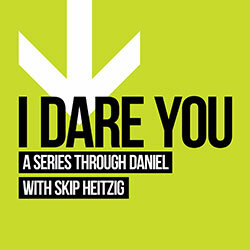 Skip Heitzig unfolds the book of Daniel verse by verse in the series I Dare You. We'll learn how Daniel lived differently and made a huge impact on his society, and we'll be challenged to do the same. I Dare You: Be Distinct! Men and women of character will rise to meet a challenge. Our challenge over the next few months will be modeled in the life of Daniel, a man of God who stood out above the rest, honored God, and influenced his world. Each week, our service will be formed around a new challenge—a dare—to rise up, be counted, be different, and above all, be pleasing to God. I Dare You: Step Up! Any crisis we face is a test. How will we respond? What actions will we take? What will our faith in God mean to us and to others in that moment of crisis? Daniel and his friends faced their moment of crisis when the King of Babylon’s insomnia became their worst nightmare. As they faced the possibility of their own death, they used the situation to display their life-giving faith. Let’s consider how we can step up to life’s difficulties and use them as spiritual opportunities. I Dare You: Speak Out! Words can become jumbled when we feel intimidated by the one we’re speaking to, especially if the one we’re speaking to intends to kill us! That’s why this story is so inspiring: Daniel speaks out clearly, boldly, accurately, and yet humbly to Babylon’s monarch and thereby gives us a model of speaking God’s truth to our world. I Dare You: Stand Up! Fitting in, blending in, and conforming to the values of the world around you is what is expected. If you dare go against the flow of popular worldly ideologies, you will be a marked person, regarded as a fanatic and relegated to the category of "dangerous individuals." Three of Daniel's friends decided it was better to stand up for God than to bow down to the wishes of the crowd. Their conviction of heart was to refuse to be "conformed to this world" (Romans 12:2). Before us is a remarkable section of Scripture with a remarkable story about a king who makes a remarkable statement. It is the personal journal of an earthly political monarch who recognizes God’s authoritative rule in the human realm. As amazing as the story is, it carries with it implications for us to submit to God by submitting to man’s government. I Dare You: Be Humble! A pundit once quipped, "Humility is like underwear—essential, but indecent if it shows!" The opposite of humility is pride, and Daniel 4 reveals it in spades. Nebuchadnezzar will learn (and then tell) about the greatest lesson God showed him in his long career—that He is able to humble those who walk in pride. So why not learn it the easy way? Listen carefully and apply these truths diligently. I dare you! I Dare You: Wake Up! As a teacher was lecturing his class, he noticed a student sleeping in the back row, so he said to the sleeping student’s neighbor, "Hey, wake that guy up!" The neighbor answered back, "You put him to sleep, you wake him up!" Falling asleep on the job may be harmless in some situations, but not as the ruler of a nation, and certainly not when God’s judgment is impending. This week’s dare is directed to anyone who is not heeding divine warning signals and needs to wake up. I Dare You: Be Faithful! Daniel was consistently faithful, both publicly and privately. His diligence and attitude set him apart from his peers and his reputation withstood harsh scrutiny. When his life was on the line, Daniel refused to compromise—he dared to be faithful! I Dare You: Be Steadfast! Calvin Miller once wrote, “Security is never the friend of faith. It is peril that produces steadfastness.” Daniel knew this to be true and was willing to sacrifice the security of life and limb because his heart was steadfast and immovable toward his God. Even though he had been faithful to king and country, this aged prophet faced the trial of a lifetime. Daniel did fine when he was thrown into the lions’ den, but how does he fare when thrust into the critics’ den? Daniel is an amazing book of prophecy as well as history, yet it has not escaped the bright white light of antagonistic critics through the ages. Today I dare you to move beyond a shallow faith that depends on personal feelings and subjective experiences and learn to “contend earnestly for the faith that was once for all entrusted to the saints” (Jude 3). The world as we know it won’t last forever. Time will not march on without interruption. Daniel saw a vision of four future kingdoms which can be documented historically. But one final worldwide antagonistic thrust against God is coming. It will be waged by a ruler typically referred to as the Antichrist (but actually there are many more names for him). A fourfold description of this coming dictator’s reign is highlighted before us. Even more basic is the choice we must all make about which kingdom we will be part of. The time is coming when the world will have to decide between a false messiah and the true Christ. Sadly, some already have. Today, we'll consider the world's fastest growing religion and how it might possibly interact with the Bible's predictions of the end times. I Dare You: Look Ahead! Economists, meteorologists, visionaries, and psychics all share one thing in common: They all try to predict the future to announce what's coming. God's prophets never had to; God revealed it to them and they simply wrote it down or spoke it out. The central highlight of Daniel's vision in chapter 7 isn't the coming kingdoms of earthly men nor of the coming Antichrist but rather the coming of Jesus Christ. Let's look ahead and see what's coming. I Dare You: Be Great! The New York Life Review posted this: "Great men have but a few hours to be 'great.' Like the rest of us, they must dress, bathe, and eat. And, being human, they must make visits to the dentist, doctor, and barber and have conferences with their wives about domestic matters. What makes men great is their ability to decide what is important, and then focus their attention on that." (I think that goes for great women too!) Let's compare three men who some consider to be great, and then see how we measure up. I Dare You: Be Shocked! When was the last time you heard someone respond to an incident or piece of information by saying, “That’s shocking!”? Shock (emotional disgust, offense, and aversion) has been diminished due to a widespread exposure to facts and images. Things get too easily relegated to a file in our brains marked, “I’ve already heard this before.” It’s a sad day (and dangerous) when we become spiritually desensitized to God’s truth and the world’s pain. I have never met a person who's regretted praying too much. I've met plenty who've regretted praying too little. Prayer is the one activity that everybody knows they need, but few actually do. It's preached often, but practiced seldom. Forgive me if I'm dispensing guilt—that's not my intention. I'd rather take a peek into the busy life of an ancient executive (Daniel), and see the role prayer played for him and, in so doing, get fired up about this most powerful of activities! Just as a square has four sides and is incomplete without all four sides, so too does effective prayer. Daniel leaves us with a great example (and a simple one at that). Though we can pray anywhere and anytime, these four elements form a great baseline for us to emulate. When you talk to God, make certain the signal is clear, your heart is pure, and your confidence is sure. God wants us to understand! He wants us to understand the truth about life. He wants us to understand the way of salvation. He wants us to understand His plans for the future. Today we come to the scriptural key that unlocks the door to the prophetic future of God’s plan. If you have never known it before, choose to understand it now. I dare you! Fighting is never fun, but it's sometimes necessary. Certainly that's the case with the Christian life: It's not a playground but a battleground. Spiritual warfare (the cosmic battle between forces of good and evil) is a reality that none can escape but few really understand. For Daniel, the curtain is pulled back and he is allowed to see past the natural world into the supernatural world. Let's get a firsthand briefing on a heavenly battle that has earthly repercussions. Daniel 11 is packed with prophecies about the history of Israel and the world. In just the first 35 verses of the chapter, we find that 135 of those prophecies have already been fulfilled. As we look at the historical details Daniel received in his visions, God's sovereignty comes to the forefront and prompts us to remember that He will carry out the prophecies yet to be fulfilled. There is nothing needed more in the world today than hope. Every generation faces the tendency toward despair and hopelessness. Daniel especially did since he was learning of his own people's future suffering that would last for multiplied generations. But at last, God gives him a precious ray of hope: The worst of times will usher in the best of times. Four words describe that future time and become four rungs on the ladder of hope. The Christian life is essentially a response to God: God is the Master and we are His servants; He's the Good Shepherd and we are the sheep; He is the Head and we are members of His body. Even our love for God is a response: "We love Him because He first loved us" (1 John 4:19). In this final section of the book of Daniel, let's consider three things that God does and what our response should be in each case. I Dare You: Be Balanced! One dictionary defines balance this way: "A condition in which different elements are equal or in the correct proportions." That's a fitting word to describe the whole of Daniel's life. In today's final study of the book of Daniel, we consider the man himself and how his life was so outwardly powerful and yet so inwardly stable. Daniel was supremely balanced in at least four areas.